Our tenth book swap is now wrapping up as the books make their way through the world's postal systems to their new owners. We had fifteen participants in this swap from five different countries! The first of our swap books to be featured is from Duane and Ben, of SurfBunny.Etsy.com. Their swap book is about their Spirit Guide, the Dalai Lama. They write: "Om Mani Padme Hum, the teachings of the Buddha captured in a single phrase. 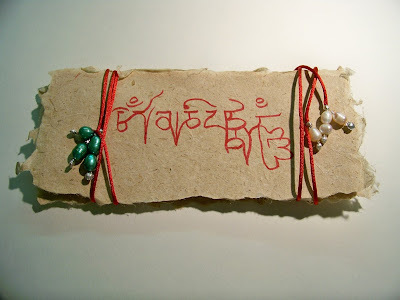 Our book is a Tibetan style palm leaf book made with our own handmade paper. The covers are banana fiber paper from our banana plants and the Om is hand written. Inside the pages are a combination of recycled paper, banana fiber and cotton linter, each piece was mould made with inclusions of rose petals and Darjeeling tea leaves. The pages contain the names of the Living Buddha, the 14th Dalai Lama. 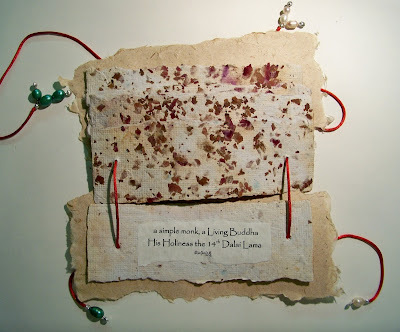 The book is bound with red satin cord and cultured freshwater pearls." Visit SurfBunny.Etsy.com to see more of their books. Oh, wow, this is a beautiful book! Duane wrote to tell me that I am going to have this one. It has not yet reached me, but I am very much looking forward to holding it in my hands. Postman, hurry up! I like how content and form and materials complement each other. Thanks in advance, Duane and Ben. Such a lovely offering from my creative little friend from another hutch. :) Yea, Surfbunny!